Although the staging that I've just about finished installing will greatly expand the capacity and operational potential of my layout, it has taken an inordinate amount of time to complete. My open house is just a few weeks away and I would like to finish some more of the mainline so that the usual crew of visitors will have more room to run on. I've come up with a harebrained scheme to temporarily connect the end of the Cheat River grade with staging and allow trains to run in and out of staging, into the center of the basement, and around the walls to a point above staging; that should be over a scale mile of running. To do this I have to finish the track on the Cheat River grade to the point where it would ordinarily enter the central helix (section in yellow on the track plan below). 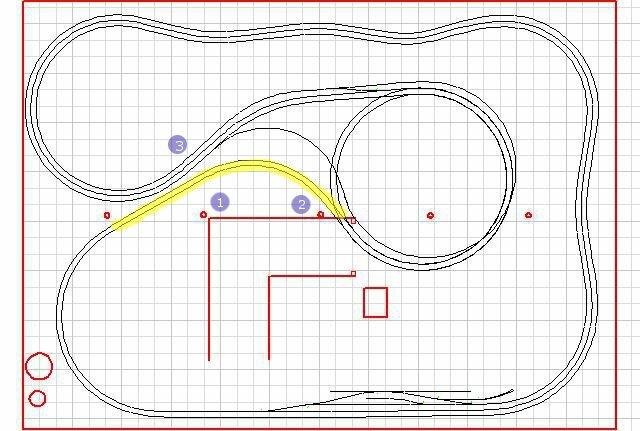 This section of the track plan is the most difficult for a few reasons. The only choke point (i.e. less than 3 ft. wide) in the operator aisle is located on this section of the layout (see #1 below). The track itself makes it's only close approach to structure in the basement where the track must pass between the supports for the basement stairs and a lolly column holding up the house (#2 below). Finally the bench work in this area is tricky. Do I build a double sided bench that holds both the Cheat River grade on one side and the top of Cranberry grade on the other? The grade separation between the two will be over 15 inches at this point and the two scenes must be separated by a double-sided backdrop which could make the bench work difficult. Or do I build two separate benches? If I do this the bench holding up the Cheat River grade will need to be somewhat shallow (16" or less) which could limit scenic possibilities and/or lead to problems supporting the backdrop (#3 below). Click on the track plan to enlarge it to see the details. I designed the track plan with 3rd Planit and, so far, the tack plan has been right on; everywhere the track was supposed to fit, it has fit. However, the track plan is only as good as the measurements that I took of the basement. If my measurements that positioned the structures in the center of the basement were off, then there is a possibility that the track will not fit. Heretofore this has not been an issue as the track has not been close to structure. Furthermore, when I measured the basement it was cluttered with 'junk', which has since been moved elsewhere, and I made at least three passes at measuring the obstructions in the basement and they did not all agree. To help resolve these questions I decided to lay out ('loft' in nautical terms) the track arrangement for the last of the Cheat River grade on the basement floor. 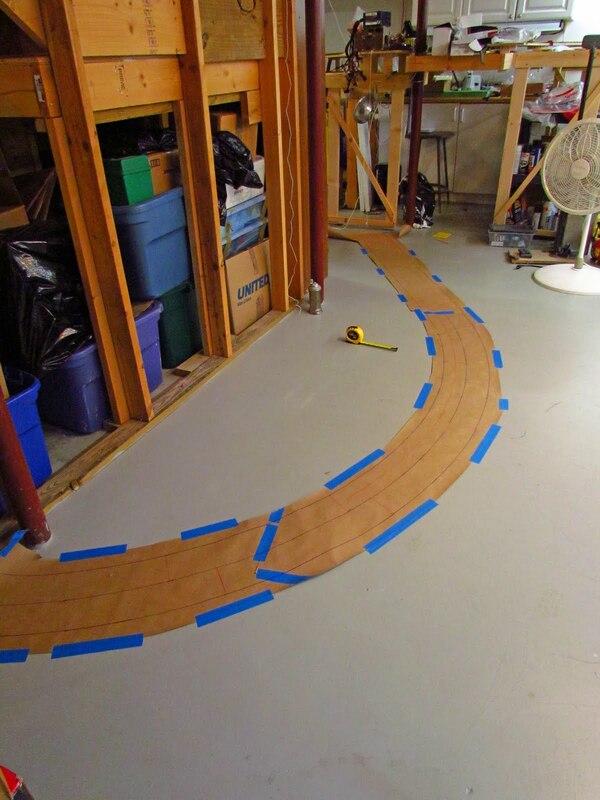 I began by lofting the curves and straightaways on kraft paper per the track plan. 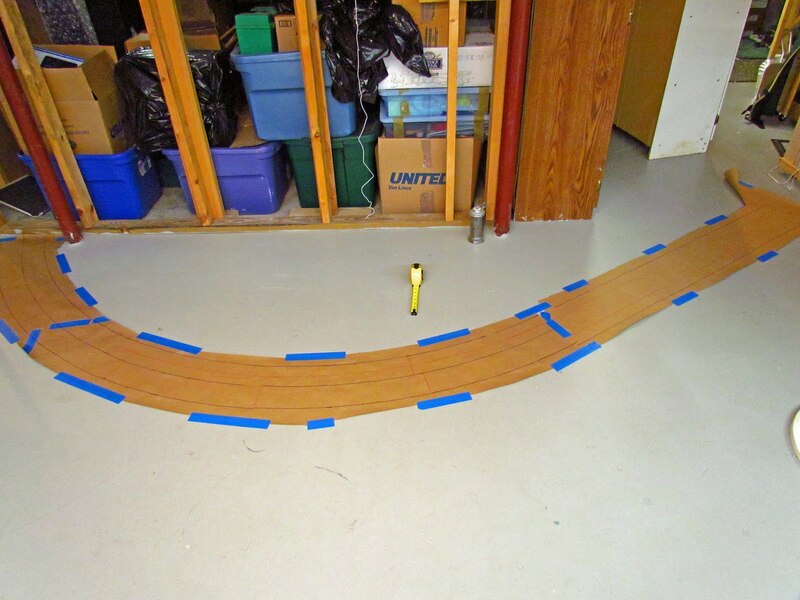 In this way I would not be tempted to cheat on the curve radius to make the track fit. 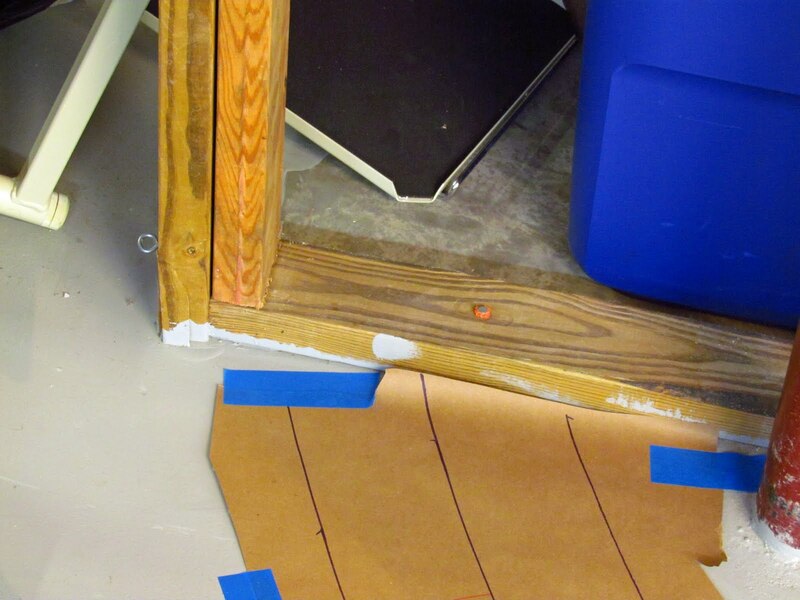 I then taped the completed kraft paper templates to the basement floor using the track plan and measurements offset from the basement walls and existing track to locate the templates; again to prevent cheating by forcing it all to fit. To my great relief everything fit, exactly as the track plan indicated. The picture below shows the overall view. The lolly column in the center is the choke point in the operator aisle. The aisle should be about 2' wide at this point and is, but I'm a big guy and from actually standing there it feels tighter. However it is literally only one point that the operators have to pass, using John Armstrong's design principles this should be OK. The next photo shows where the track must pass between another lolly column and the support holding up the basement stairs. It should JUST fit. The leftmost line on the paper template is the left hand side of the allotment for that track, 2" offset from the track center line. Since I did my 3rd Planit using track center lines, but lofted the templates using the full clearance for the swing of cars, I believe that the two are in agreement. I'll have to test this point with both full length passenger cars and articulated locos when I lay the track, but I have no qualms about notching that 2x4 if I need more clearance. This final photo is the overview from another direction. The faux wood grain cabinet next to the lolly column (right) has been moved back to make sure that it does not contribute to the choke point. Seeing the track lofted on the basement floor confirmed a decision that I had already made, I will build separate bench work for the Cheat River and Cranberry grades. This is partially a decision of convenience, I can get this section done faster that way and put off some vertical alignment decisions until later. I hope that I will not regret this choice later on.